Chartered Engineering & Outsourcing was formed in 2007 in Lahore, Pakistan with a vision of providing quality and efficient Engineering, Procurement, and Construction Management (EPCM) and Consulting Services to clients in Hydrocarbon Processing, Petrochemicals, Fertilizer Industry, Power Generation and LNG business. 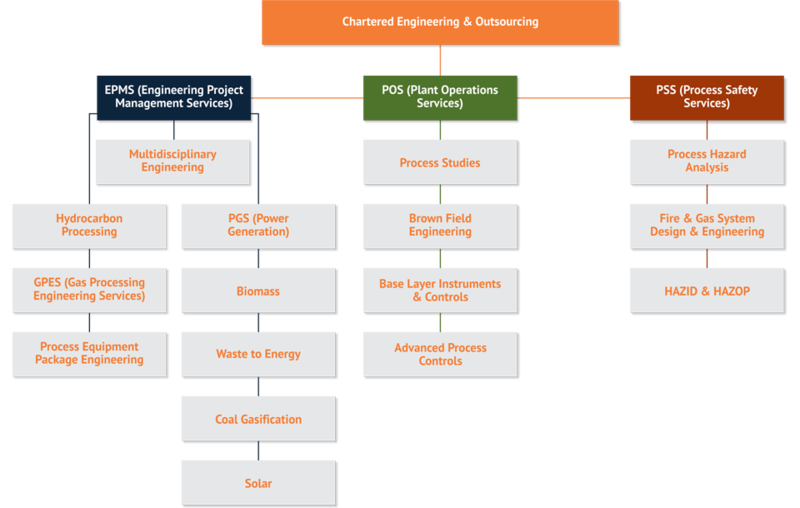 Chartered Engineering and Outsourcing is a diversified EPCM and Consulting Services provider company that helps our clients to optimize their project and operations cost, extend capacity, shorten lead times and maximize their engineering resources availability by providing support and services across the entire process life cycle of industry. We provide an extensive range of services and products through our various departments that include providing project management services for various engineering projects, plant operations support and process safety services. We have the infrastructure to cater to various industrial projects and provide services in Hydrocarbon Processing, Gas Processing Engineering, Process Equipment and Package Engineering. In the Power Generation fields, we deal with power production from biomass, coal gasification and solar energy. With regards to Process Safety we can do complete HAZID and HAZOP, Process Hazard analysis along with the designing of Fire and Gas Systems. Why Choose Chartered Engineering and Outsourcing? We draw strength from effective partnership, collaboration and teamwork regardless of organizational, cultural or geographical restraints and this helps us deliver a winning combination with integrity and safety.